tasty from the looks of it. 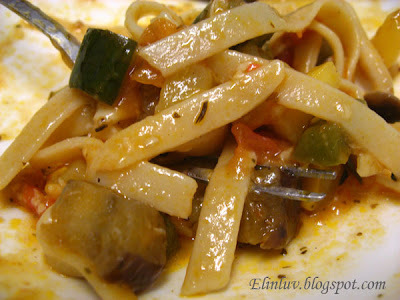 ratatouille has emerged rather famous, after the movie. previously, I had no idea that it's a vege dish. I bet this pasta must taste good without meat! 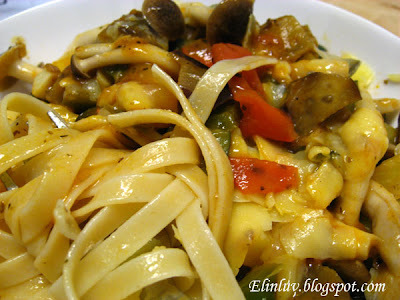 I get to know this dish after visit Ratatouille at Disney World! haha! late comer..eh? 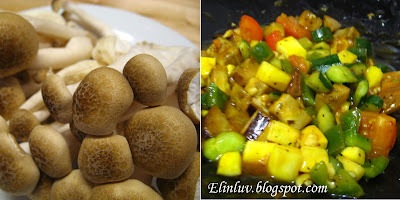 oo.. was directed to your blog by beach lover..love the sound of this dish- esp with all the veges..very healthy! I adore ratatouille. ANd, I think a one dish is fine when there are other things to do. I would love to try this recipe as I've been inspired by the cartoon of "Ratatouille" and now you've inspired me. This one looks really tasty! Thanks for sharing! you have just combined 2 of my fav food, yeah ! *skipping around the house* i can imagine that it will be super finger lickin good. will try this out soon, hopefully it will turn out as good as yours. looks good n yummy Elin, u cooked it so well! must cook this for myself n hubs when we're alone:) cos the kids wont eat it wth al the veggies in there..sigh..
@ daphne : Hi Daphne, thanks for dropping by :) this is a healthy one dish meal. Delicious too! @ Mima's Oven : Hi Mima's Oven, thanks for the award, I am honored and I appreciate it very much! @ Captn Rachel aka The Pizza Cutta : Thanks, it was a great combo no doubt! @ Skinnymum : Glad you like it..haha of course it will turn out nice :) Just make sure the sauce is thick and is able to coat the fettuccine! WOw..this looks incredible, as always. 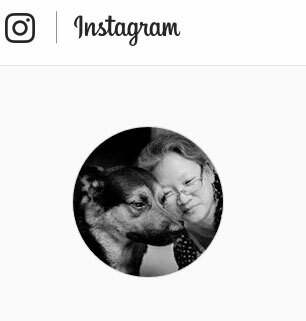 You are a very talented women with creative yummy dishes. 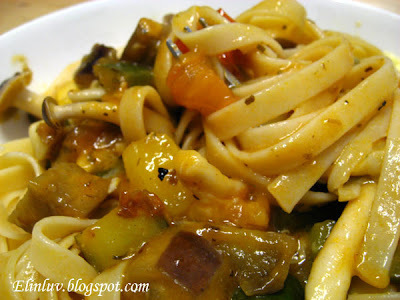 This pasta looks very delicious!! I can hear the drumming sound from my stomach even though I just had my breakfast. 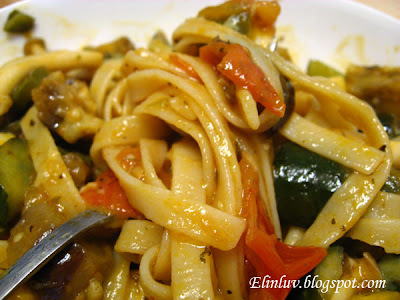 Haha, each time I revisit this post, my stomach will start growling too coz I knew this ratatouille with the fettuccine was good and I wanna have another round of it :p Do try it out yourself..it is yummy!